Following a suspense-filled road win against the favored Boston Red Sox on Thursday night, the St. Louis Cardinals climbed back into contention and set their postseason high for World Series probability. With a 47% percent chance to win it all, the Redbirds are right back in it. At 53%, Boston registers its lowest World Series chances since the off day prior to Game 6 of the ALCS. Since St. Louis was able to split the first two game at Fenway Park, they now have home field advantage for the remainder of the series. This advantage is worth about 4% of their title chances. In other words, if the two teams were playing at a neutral site, Boston would have a 14% advantage rather than 6%. Regardless of who wins on Saturday, this advantage will disappear once more. 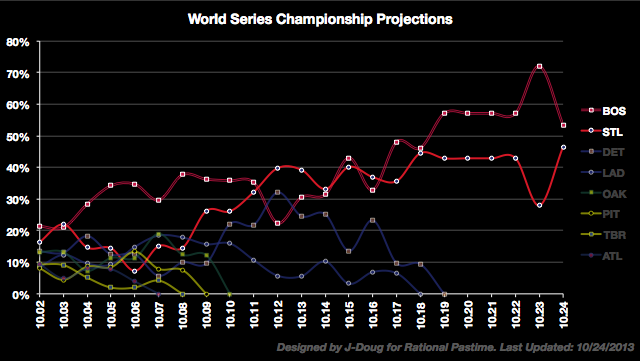 Keep reading for updates on the most likely World Series outcomes. A Red Sox victory is still the most likely result following their Game 2 loss, but now the most likely individual outcome is Boston in seven games rather than six. 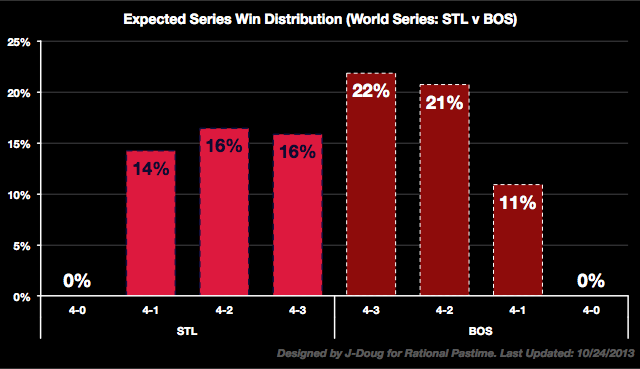 A Boston victory in six games is now the second most likely outcome, followed by a St. Louis win in six. All-in-all, the Cardinals are in a much better position than they were even before the Fall Classic began, and the numbers look good for a long series with lots of swings in WS%. The reason that the projection system still doesn't favor St. Louis even with their home field advantage is because of Boston's continued lead in the ratings system. The Red Sox's ratings supremacy will likely continue throughout the World Series. For St. Louis to surpass Boston in the Elo-based ratings system, they would likely have to win three straight—and with large scoring margins that would inflate their Pythagenpat numbers. At that point, the World Series would be over and the numbers would become meaningless in an actuarial sense. Tune in on Sunday to see if the Cardinals can surpass the Red Sox in WS% for the first time since October 16.